Do you feel like Mother's Day gift giving is tricky? Try buying for a mother who just turned 96! But I want to give her something and make her day special because I love her so much. She is and has always been the best mother ever. I am a grandmother to 10 grandchildren now and I feel like I am still learning from her. I tell her that is why she is still with us, because I still need her. Personal Gifts that can be Personalized! Look at this wonderful gift from Little Flower Soap Co. It is only $28.00! This shop has 5 star reviews. LittleFlowerSoapCo's products are handmade with natural products and scents and they have a number of sets to choose from! Fresh Retro Gallery has this great family tree that can be framed and hung on the wall. These family trees from Framed Retro Gallery are 2 for the price of 1 ! That is two gifts taken care of. Not only that, she gives you lots of tips on how to use them. Of course, I love the name of this seller's shop, StanleyWinked. And, I love this necklace! The dates of when she became a Mom and when she became a Grandma! I am so drawn to this necklace from Stanley Winked! This one shown also has my birthstone on it, which is a happy happenstance since I became a grandmother on my birthday! The price is so reasonable, too! MarkFabric has a lot of bag choices. I happen to know a couple of people who would love this purple one. Mark Fabric has a large variety of messenger bags and 5 star ratings! This bag is so cute, I know you know someone who loves purple who would love it! Diane, you know who you are! TiffanyAvenueBridal has some adorable necklaces at great prices! Tiffany Avenue Bridal has the perfect necklace for the collectors of elephants, giraffes and other animals. These sketches from Graphic Wisdom are amazing! I would love a sketch of my family, or my husband and I, or my grandchildren, or all of the above from Graphic Wisdom. Wall Tonic Arts can help you preserve the memory of a family home. My sister-in-law once had a painting done of my husband's grandmother's home that had been in the family for many years. It was a great idea and a real keepsake. Wall Tonic Arts can help you have a keepsake of our own, whether it is an old home or a new forever home. If you want the home portrait done in color, Blessed Willow Gallery can do that for you. Not only does Blessed Willow Gallery do watercolor paintings, but they also do ink drawings as well! These are my Etsy choices for this year! If none of them fit with the tastes of your mom or grandma, Etsy has many more suggestions here! I am sure you can find just the perfect gift if you take a look! But, believe it or not, time is running short. If you find something wonderful that I haven't listed, please let me know in the comments below! I just found out that February is National Cherry Month! Whew! We almost went the whole month without celebrating it! That was a close one. 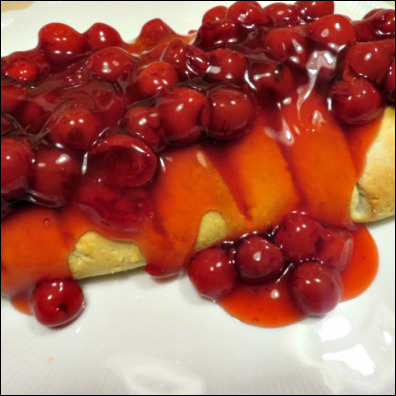 Friday Faves late edition today is all about our favorite cherry recipes! Lindsey's choice is Cherry Pie, made with fresh cherries! Remember that if you want all kinds of pie recipes, you can find them in our Pie Book, available as an eBook on etsy. Maddy's choice is similar to LIndsey's. She loves the little cherry hand pies that we also feature in our pie book. You can get our pie book today for $2.00 off with code CHERRYFEB if you head to our etsy shop today! Alicia's choice is the Black Forest Cake she shared when she was doing international recipes. She says that she can't stop thinking about this cake. It was so good. Helen's Choice: Okay, I had a really hard time choosing! I love the angel food cherry pie cupcaken! But I also love this Cherry Coffee Cake! So, there you go! Hurry before the month is over and celebrate National Cherry Month! If you try any of these, let us know how you like them! Etsy is such a wonderful place to shop for unique gifts that are often handmade or vintage. It is so great to find things that you can be pretty sure won't be duplicated by anyone else when you gift them. I can spend hours on that site just checking out all of the awesome things! Unfortunately, it can take hours to find all of the awesome things and during the holidays we don't have hours to spend to find that perfect gift. So, we are here to help you out on today's Friday Faves! These are the best gift ideas we have found this year on Etsy and I think you will find a little something for everyone on your list in this collection. Do you have a favorite shop on Etsy or have you found a perfect gift idea on there that we missed? Be sure to list your faves in the comments! Indoor Teepees! What child wouldn't want one of these? I think I want one actually. These are on sale right now, so I hope you don't miss that sale. But, if you do, the regular prices are really good anyway! Here is another link to some adorable teepees that look so comfy, I'll bet the kids will want to nap in them! Personalized Baseball Bats! Because quite a few of my kids played Little League, these bats caught my eye! I know that even my grown boys would love these mini bats! Mini Rolling Pin! If you have a kid who loves to bake with you, these little rolling pins would make ideal stocking stuffers! The price is just right. They come in a variety of sizes at EarlyAmericanShop. While you are at it, you may want to add this awesome kid's baking set from PeelHouseCrafts! This set comes with a lined apron with a pocket, fully insulated oven gloves, tea towel with hanging tag and a wooden spoon, all fit into a matching tote! Baby's First Christmas Ornament! I am in the market for a couple of these this year! Christmas Keepsake has these adorable ones that are personalized for your baby. There is a boy version as well! And, look at this one with a photo of the baby on Happyism! How do I choose? My Sister-in-law will love the elephant for her new grandbaby! Chess Sets! I love to play chess, even though I am not very good at it. My son-in-law on the other hand is very good and very patient with me when we play. I wish I had looked on Etsy when I was shopping for a chess set for him! KGcraftstore has some awesome sets to choose from. Blanket Chest! I am a sucker for wooden chests. DNMwoods has some great ones at very reasonable prices! Look at this one for only $88! Warmed Slippers! Do you know someone with perpetually cold toes? You now have the answer to their problem! SnugToes sells slippers with removable heat pads that you can rewarm in the microwave that will keep toes toasty. They look really comfy as well! Embossed Rolling Pin! I love these things and this one is priced right, plus free shipping! French Pastry Rolling Pin! I have 2 rolling pins that I have had since I was first married. I think that when I was first married, I didn't know the proper way to care for them and now the handles are fallen off and they are splitting. So, I am in the market for a new one. I love the sleek look of this French pastry pin. Does anyone have any experience with these? Please let me know. This one offers free shipping! Cool Lamp! Does anyone ever really have enough lighting? A really cool lamp would make a great gift for anyone's office or bedroom or living room. I love the look of steampunk accessories! Go figure! This lamp by UrbanIndustrialCraft is something that I would love! They have many choices. Handmade Wooden Bread Knife! If someone in your life is a bread baker, this is a wonderful gift! I know I would love it! This shop,AtelierDuGrandPIc also carries beautiful cutting boards and wooden spoons. This knife would definitely be a useful, one of a kind gift! The cutting board is sold separately. DIY Gifts If you really love to give gift that you have crafted yourself, here are some patterns and kits to help you out. Harry Potter Themed Embroidery Kit! A friend of mine just made one of these for another friend and it came out so cute! There are so many Harry Potter fans out there who would love one (or two) of these. You will find these kits on LarkRisingEmbroidery. ​ Did you get some good ideas or inspiration? I hope so. I know I did! What were your favorite gift ideas?